KD and Russ making nice, Kyrie and LeBron gelling again, and every jersey suddenly in black and white. Yup, the blending and blurring of the NBA's lines really made a difference tonight: these teams played HARD out there. Sure, the All-Star Game was high-scoring. That'll always be a guarantee. These are the best players on earth hitting the court for our enjoyment; there's no Iman Shumpert to nab the open bricks. But nobody who watched that game could disagree with the fact that there was clear chemistry and intensity. 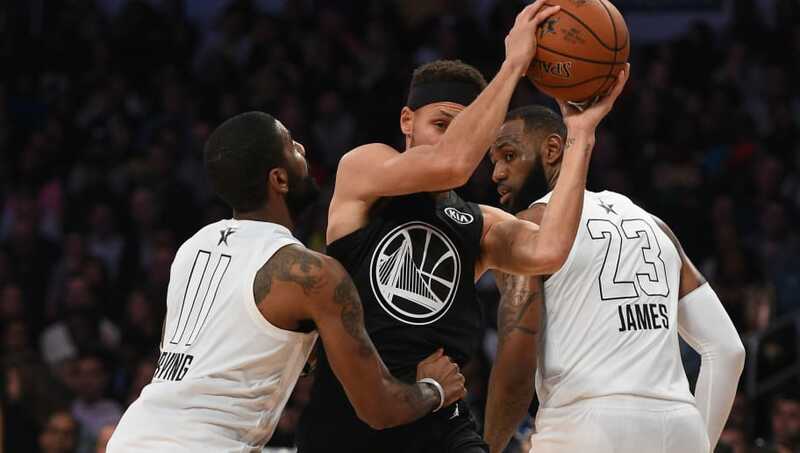 And after a late Team LeBron surge in the final minutes, they copped a 148-145 victor, sealed by lockdown defense in the final 10 seconds when all Team Steph needed was a three. They didn't even get a shot off. Everyone other than a tired-out Jimmy Butler gave supreme effort, though Steph Curry's second half disappearance up top was a little curious. When it got down to the nitty gritty, though, it was clear there could be no crew more dangerous than LeBron, Russ, KD and Kyrie down the stretch. The spacing, the ferocity, the moves...this was truly what an All-Star Game has always been meant to be. Russell Westbrook missed a key late free throw on an and-one chance, and we were actually mad. That's an All-Star feeling I've never had before. Sure, it wasn't without the jokes of old. ​Steph with the second-half popcorn and the NBA's bizarrely warped idea of an appropriate pregame show (and anthem, and halftime show...) got us going. And one element of the proceedings remains...undefeated. But this was a massive, monumental step up from previous All-Star contests in terms of competitiveness when it counted, and we can't wait to see next year's blended group of personalities take flight again in Charlotte in front of the Jumpman himself. Let's ​televise the draft next time, though?